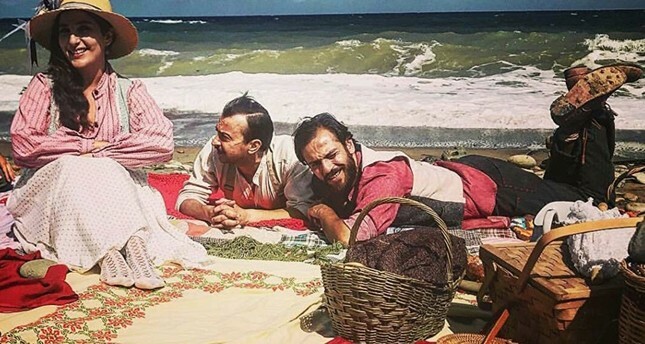 Ali Atay (center), Şebnem Bozoklu (L) and Erkan Kolçak Köstendil in “Turkish’i Dondurma” (2019). A film titled "Turkish'i Dondurma" ("Turkish Ice Cream"), telling the story of two Turkish men living in Australia at the time of the Battle of Gallipoli and their struggle to get back home, hits the silver screen on March 15. Starring Erkan Kolçak Köstendil, Ali Atay, Şebnem Bozoklu and Will Thorpe, the film was produced by Mustafa Uslu for Dijital Sanatlar Production Company, which broke records with their previous films "Ayla" and "Müslüm." Speaking at a publicity meeting for the film, held at Soho House Istanbul, Mustafa Uslu said, "Turkish'i Dondurma" is a challenging production like the other films by the company. The film was also inspired by a real-life story, like our previous two films. The result is great. We hope that the spectators will appreciate it." Director Can Ulkay (center), actor Erkan Kolçak Köstendil (right), Ali Atay (left), ﬁebnem Bozoklu (2nd R) ve Alma Terziç (2nd L) at the press meeting on Jan. 15, 2019. Uslu said that he really loved the story. "We conducted a study on the story. It was such a pure one. Our actors spent time on the movie within quite an intensive schedule. We managed to touch upon the hearts of the spectator with the movie 'Ayla.' We hope to do the same with this film. Maybe we can touch the hearts with the performances of the characters Ali and Mehmet this time. We try to show that nobody wins at the end of a war." Feeling hopeful about the film's box office returns, Uslu said: "If you produce good quality work, you get satisfactory results. We did our best to produce something beautiful. Turkey had a wide audience profile with cinema once. We managed to make them come to the cinema again with the films like 'Ayla' and 'Müslüm.' This makes us proud." The film's director Can Ulkay said that shootings for the film took place in Istanbul. "The shooting took two months. We had to suspend the work due to weather conditions at times. The film has such a special story. When Mustafa first told the story, it was a strict one. However, we first scripted it and then transformed it into a super dramatic fiction, hammering the story home with our team. The spectator will be presented with some humorous moments in the film." Actor Ali Atay said that he was really impressed by the story. "The film is based on a real-life story. With Erkan, we talked about the ways of making it more real. There are two insane characters in it and it is quite difficult for normal people to portray them. I never guessed that the film will make us laugh to such an extent. We shot most of the scenes laughing." Erkan Kolçak Köstendil pointed out that foreign actors and actresses took part in the film and added: "They really loved the story and the work itself, which I think is quite important. For example, the story presents a British lieutenant as an evil character; however, the British actor loves the film. It may seem a bit weird, but it is not. In fact, we try to expose how bad war is and how it separates societies. That's why foreign actors really loved the production. Hence, the film has a universal side that excites us." Bosnian actress Alma Terzic, talking about the character Ross, said: "The shootings began in such a fantastic way. I experienced how Turkish and foreign actors work together in a film set. They worked for the same project without speaking, communicating just in the language of art. Nations have experienced trust problems recently. I hope that this film will kill this distrust and serve as a bridge between nations." Actress Şebnem Bozoklu said that the shooting was very entertaining and easy. The film was shot on an area of 7,000 square meters that resembles a town of the 1900s. It tells the struggle of two friends living in Australia. The ice-cream seller (Ali Atay) and cameleer (Erkan Kolçak Köstendil) hear that the Anzac army will go to their homeland with the call of the British. The buddies are not permitted to go back to their country and they fight to find a way out. The comedy-drama also stars Caner Kurtaran, Marleen Mathews, Tristan Alexander, James Farley and Carl Warthon.